View More In Vitamin C.
Vitamin C plays an essential role in the formation of collagen, connective tissue that is required for normal maintenance, growth, repair, and healing of living tissues. Vitamin C also functions as an antioxidant, and protects other antioxidants such as selenoproteins, glutathione, and vitamin E from becoming oxidized (inactivated) in the body. * Since vitamin C is constantly being utilized, it should be taken in small repeated doses throughout the day. 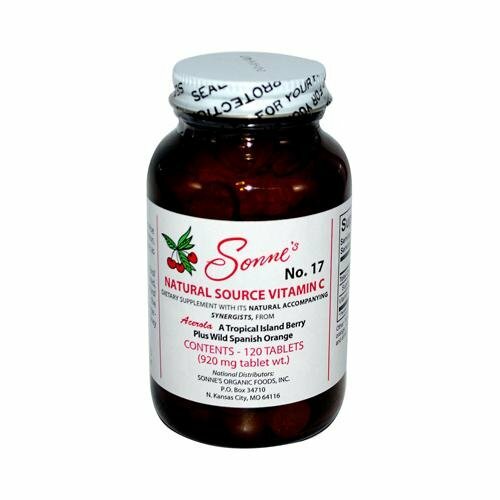 Our chewable tablets are ideal for this purpose, providing easy and rapid absorption of the natural vitamin C complex. Because acerola berry and wild spanish orange are naturally sour and bitter, we add powdered blackstrap molasses and honey for a tart but pleasant taste. If you have any questions about this product by Sonne's, contact us by completing and submitting the form below. If you are looking for a specif part number, please include it with your message.